The lack of certain essential polyunsaturated fatty acids (PUFAs) induces perturbation in cell proliferation, apoptosis and dedifferentiation that could be linked to an increased protumorigenic trend. Contrarily, n-3 essential fatty acids (EFAs) arrest cell proliferation in several tumor models. According to the concept of field cancerization, multiple patches of abnormal epithelial proliferation may coexist in the vicinity of oropharyngeal neoplasms. The purpose of the present study is to determine whether certain dietary PUFAs differentially modulate the patterns of cell proliferation and apoptosis at non-tumoral sites of the oral mucosa in mice bearing DMBA induced salivary tumors. 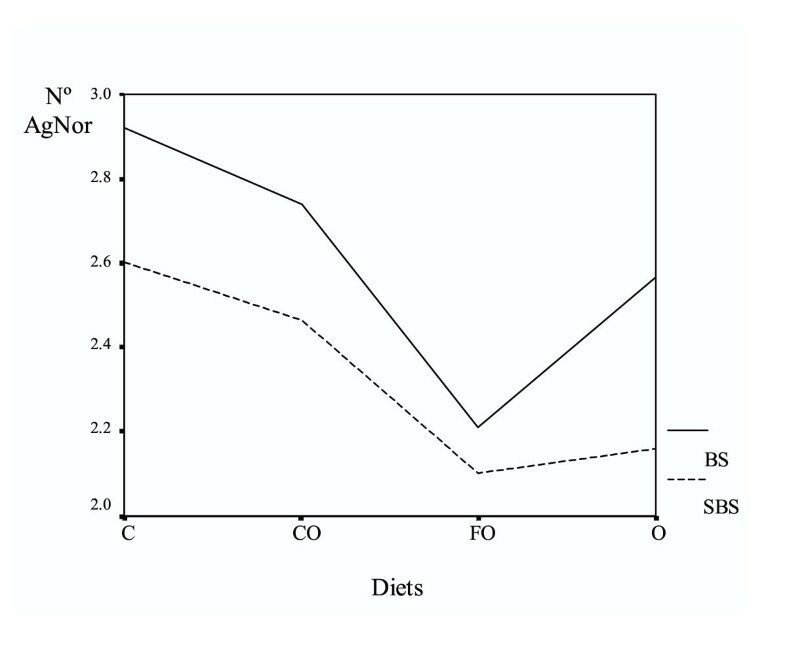 After weaning, BALB/c mice were assigned to four diets: Control (C), Corn Oil (CO), Fish (FO) and Olein (O). Two weeks later, DMBA was injected into the submandibular area. The animals were sacrificed between 94 and 184 days at 4–6 PM. Fixed samples of lip, tongue and palate were stained using H-E and a silver technique. A quantification of AgNORs in the basal (BS) and suprabasal stratum (SBS) of the covering squamous epithelia as well as of mitosis and apoptosis was performed. Analysis of Variance showed greater proliferation in tongue than in palate or lip. According to the diet, a significant difference was found in the Fish Oil, in which palate exhibited fewer AgNOR particles than that of the control group, both for BS and SBS (p < 0.05 and 0.152, respectively), indicating a reduced cell proliferation. These results corroborate and reaffirm that the patterns of cell proliferation, apoptosis and differentiation of the oral stratified squamous epithelium may be differentially modulated by dietary lipids, and arrested by n-3 fatty acids, as shown in several other cell populations. Oral mucosa has a squamous stratified epithelium with four cell layers, namely: basal, malpighian, granular and corneum. Proliferation, which takes place in the basal stratum, along with differentiation and apoptosis must be in balance due to the permanent cell renovation. Essential fatty acids (EFAs) such as linoleic acid (n-6 LA) and α-linolenic acid (n-3 ALA) are food lipids obtained only from the diet. Cell proliferation, differentiation and apoptosis was shown to be modulated by n-3 and n-6 EFAs in different tissues [3, 10]. Contrarily, the essential fatty acid deficiency (EFAD) induces phenomena of cell proliferation and dedifferentiation along with abnormal apoptosis that could be linked to an increased protumorigenic trend. These facts were observed in skin, oral epithelium, esophagus, salivary glands, urothelium and intestine of rats. [4, 5, 12, 14, 15, 18]. The modulating effects of EFAs have been found not only in normal but also in neoplastic tissues, such as breast, colon and urothelium [3, 11]. Recent experimental studies have shown that n-3 fatty acids exert a protective effect on murine salivary gland tumors, whereas n-9 olein enriched diet, which induces an EFAD condition, has a promoting activity . Molecular and clinical evidence support the phenomenon of field cancerization for head and neck tumors [8, 13]. Some varieties of salivary gland tumor proliferation may coexist with oropharyngeal neoplasms . They may also adopt a biphasic differentiation pattern [6, 7] and develop adenocarcinomas or epidermoid carcinomas, the latter arising from their epithelial components . The purpose of the present study is to determine whether certain dietary PUFAs differentially modulate the patterns of cell proliferation and apoptosis at non-tumoral sites of the oral mucosa in mice bearing 9,10-dimethyl-1,2-benzanthracene (DMBA) induced salivary gland tumors. Forty-eight BALB/c mice of both sexes were randomly assigned, after weaning, to four dietary groups: Control (C), Corn Oil (CO), Fish (FO) y Olein (O). The first was fed on a conventional diet containing 5% mixed fat, 20% protein, 67% carbohydrates and 2 % fiber. The rest received a basic semisynthetic formula containing: casein 17%; sucrose 34.9%; corn starch 38%; fiber 2%; salt mixture 3.5%; vitamin mixture 0.5% . This preparation was supplemented with 5% corn oil (CO), fish oil (FO) or double refined olein (O) (80% of 18:1 n-9; Retienne, Argentina), enriched in n-6, n-3 and n-9, respectively. These diets, which were stored in sealed dark containers at -5°C, did not significantly differ in caloric value per gram weight. Food and water were provided ad libitum to the animals, which were kept in a light and temperature controlled room. Fatty acid composition of dietary formula is shown in Table 1. Fatty acid composition of dietary fats. Mono-UFAs: monosaturated fatty acids; PUFAs: polyunsaturated fatty acids; tr: traces. * Control (C), Corn oil (CO), Fish oil (FO), Olein (O). Values represent percentage mean of each fatty acid for no less than three samples run in duplicate. Two weeks later, 0.5 mg 9,10-dimethyl-1,2-benzanthracene (Sigma) diluted in 1 μl of corn oil was subcutaneously injected into the submandibular area. The animals, which developed histologically confirmed salivary tumors in 100% of cases, were sacrificed between 94 and 184 days at 4–6 p.m. The study followed the protocol established for salivary gland tumors  and the whole head was randomly taken from 16 mice to carry out the present analysis. The heads were fixed in 10% neutral formalin and samples of lip, tongue and palate were obtained. They were embedded in paraffin, sliced perpendicularly to the mucosa so as to observe all the constitutive strata and 3–4 μm non-serial sections were stained using Hematoxilin-Eosin (H-E) and the Ploton's silver technique for AgNORs . By using an Olympus BH2-DO light microscope at 400×, a quantification of AgNORs (Nucleolar Organizer Regions) in the basal (BS) and suprabasal stratum (SBS) as well as of mitosis and apoptosis was performed on silver-stained and H-E sections, respectively. The microscopic examination was carried out by two different observers who were unaware of the dietary conditions of animals. A total of 100 cells were counted (50 in BS and 50 in SBS) for AgNORs, whereas mitosis and apoptosis were recorded for 20 fields (Fig. 1). Small cells with fragmented pycnotic nuclei and eosinophilic cytoplasm surrounded by vesicles were considered apoptotic  (Fig. 1-D). A: Dorsum of tongue, Malpighian layer. Silver Nitrate staining for AgNOR bodies within the nucleus (arrow). 400×. Olein supplemented diet. B: Dorsum of tongue, Malpighian layer. Fish oil enriched diet. Fewer AgNOR particles are observed (arrow). C: Malpighian layer of lip. 400×. H-E. Several mitosis are shown. Olein supplemented diet. D: Squamous epithelium of the dorsal aspect of tongue with one apoptotic figure (arrow). 400×. H-E. Corn oil supplemented diet. Means were calculated from the data of the observers for palate, tongue and lip. The Analysis of Variance was applied to compare localization and diets. Through AgNOR and mitosis quantification, the tongue epithelium presented greater proliferation than palate and lip, both in Fish and Corn Oil groups (Table 2). According to the dietary formula, a significant difference was found in Fish Oil group (rich in n-3 family of PUFAs), in which palate exhibited fewer AgNOR particles than that of the control group, both for BS and SBS (p < 0.05 and 0.152, respectively), indicating a reduced cell proliferation) (Fig. 2). Number of AgNOR in palate basal and suprabasal strata according to diet. Cell proliferation and apoptosis according to localization and diet. Among other mechanisms, tumor progression involves non-arrested mitotic activity followed by inflammatory infiltration and necrosis. These cellular events make the morphological evaluation of mitotic and apoptotic figures difficult. So, considering that the subcutaneous injection of DMBA may also affect the surrounding areas, we analyzed certain non-tumoral, apparently normal tissues. This approach fits in well with the concept of field cancerization [8, 13]. Present results corroborate and reaffirm that the particular patterns of cell proliferation and differentiation of the oral stratified squamous epithelium may be modulated by dietary lipids . In particular, n-3 fatty acids comparatively diminished the hyperproliferative effect linked to DMBA administration. The beneficial effects of n-3 rich food should be emphasized in the prevention of oral neoplastic lesions, as previously proposed [1, 2]. ABA and ARE conceived of the study and participated in its design and coordination as well as in the experimental pathology. DC carried out the microscopic examination. GM applied the histologic techniques. SJ participated in the statistical analysis.